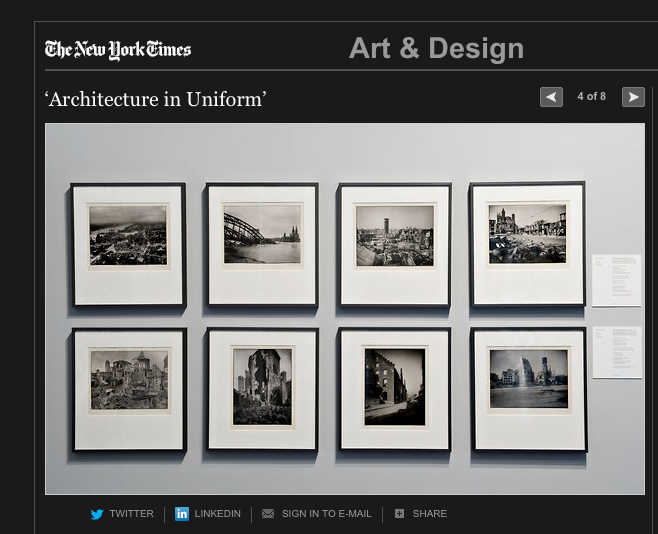 The New York Times features a slideshow in its piece Wartime Architects: Creating Amid Chaos, on the Canadian Centre for Architecture in Montreal's exhibit "Architecture in Uniform: Designing and Building for the Second World War." 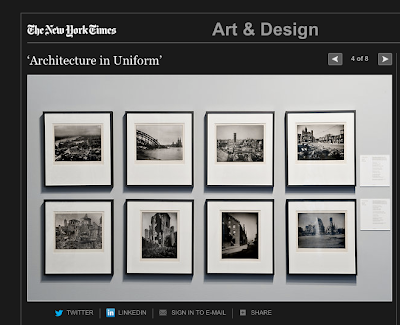 This slide depicts shots of wartime destruction by the German photographer August Sander. Here, Paul Jaskot discusses his new book and how it also investigates how culture was influenced by the impact of "Nazi perpetrators"—and who was or was not considered a perpetrator. Original photo credit: Canadian Centre for Architecture, Montreal. There seems to be a great deal of interest in World War II recently in the art museum world. Major exhibitions in the last year on Soviet posters at the Art Institute of Chicago and a comparative survey of “Architecture in Uniform” at the Canadian Centre for Architecture in Montreal, as well as a show of war related photography going on now at the Houston Museum of Fine Arts point to a willingness of curators to look beyond the canonical stylistic and market-driven categories of art to consider broader questions of social and political history. I’ll be visiting Rice University in Houston this spring and am very much looking forward to seeing the latest installation at the MFA. These trends to me seem to speak to the broader public interest in a more complex and historical response to visual culture. I think these kinds of shows form an important backdrop for some of the issues I tried to raise in my book, The Nazi Perpetrator: Postwar German Art and the Politics of the Right. While I have focused for the most part on well-known artists and architects—Kiefer, Libeskind, and Richter, for example—I have also tried to extend the art historical debate to address major concerns of interest to a broader audience, much like these exhibitions do. In particular, I attempt to expand on the popular studies on the memorialization of Nazi victims to ask how culture also was influenced by the impact of the perpetrators. You can search far and wide and come up with relatively few art historical accounts that take Nazi perpetrators seriously as a subject for culture, let alone rightwing debates in the postwar period. But we know that, from moderate conservatives to the most extreme neo-Nazis, the relationship between who was defined as criminal in the National Socialist past formed a constant point of reference. As such a major component of postwar West German and then reunified German politics, how could it not also be an issue of concern to artists and architects? One of the important arguments that I made was that, indeed, these debates about who was or was not a perpetrator were of concern at particular moments in the cultural postwar history. The interpretation of Daniel Libeskind’s Jewish Museum in Berlin, for example, radically shifted as the specter of the rise of neo-Nazis after the fall of the Berlin Wall in 1989 became a matter of public concern and debate. These radical right groups made strategic connections between their own actions and the ideologies or policies of the past. The possibility that a resurgent Nazi perpetrator could be on the horizon drove an interest in completing the museum as well as a new look at the meaning of the dynamic and innovative architectural forms. Certainly, the category of the perpetrator like the politics of the right itself was neither static nor consistently employed in postwar Germany. But the continued interest in and fear of the recent past came in waves in which the debate clustered around specific definitions of the perpetrator and her or his significance to contemporary art and architecture. As in the case of Libeskind’s building and reunification, I argued that those moments in which the debate crystallized help us to explain the resonance of National Socialist Germany with all corners of society. These recent exhibitions that take up art and war complement this argument. In the Chicago show, Peter Zegers and Douglas Druick led a curatorial team that displayed an astounding array of Soviet posters used internally and externally to promote the Allied cause. The emphasis here was on the political use of imagery for the war effort. So, too, Jean-Louis Cohen’s Montreal exhibition showed not only familiar icons of Modernist design such as Albert Kahn’s Chrysler tank factory in Detroit but also a wide range of architectural projects, from vernacular to highly symbolic buildings like the Pentagon, that supported the war effort of the Allies and the Axis. I think highlighting the political function of art and architecture helps us to see a more comprehensive and realistic picture of culture, both then and now. Our intellectual work in the museum or the pages of a book can exemplify such a political history. That seems to me a worthy critical goal for art history as a whole. Paul B. Jaskot is professor of art history at DePaul University. He is author of The Nazi Perpetrator: Postwar German Art and the Politics of the Right; The Architecture of Oppression: The SS, Forced Labor, and the Nazi Monumental Building Economy; and coeditor of Beyond Berlin: Twelve German Cities Confront the Nazi Past.